“We had several international collectors benefiting from the high dollar and the tax exemption during SP-Arte this year. We’re pleased we sold Abraham Palatnik to US collectors. Unfortunately, our sales were lower overall than in last year’s edition of the fair, but given the current Brazilian situation, we’re very pleased,” sums up Daniel Roesler, son and associate partner along with his brother Alexandre of Brazil’s gallerist Nara Roesler, a highly energetic quick-witted petite woman born in Northeastern Brazil’s Recife who started in the art trade in her native city when she was only twenty-three years old. 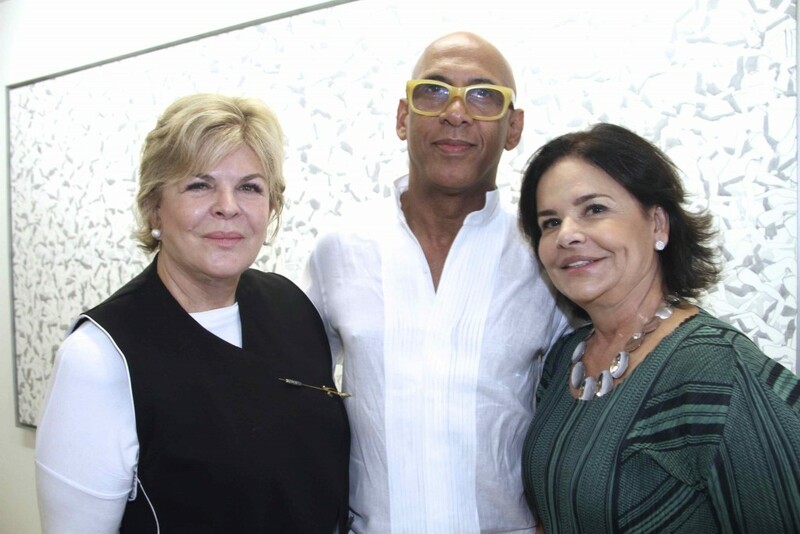 Among the feats of this family-business trio is the fact that in 2015, Galeria Nara Roesler posted a ten-percent sales increase while the general Brazilian art market suffered a fifty-percent slump. Today, Nara Roesler boasts three locations anchored by an ample headquarters in two interconnected buildings in chic Avenida Europa in São Paulo. A second branch in Ipanema in Rio de Janeiro opened in 2014. But it was the international expansion this February into New York’s Flower District that staked her reputation as Brazil’s leading art gallerist. Nara Roesler represents Brazilian artists Vik Muniz, Helio Oiticica, Tomie Ohtake, Daniel Senise, Laura Vinci and Marcos Chaves, alongside such international names as Julio Le Parc, Daniel Buren, Marco Maggi and Xavier Veilhan. I recently interviewed Nara Roesler during the opening preparations for the current pair of solo exhibitions in her São Paulo complex with Brazilian master Antonio Dias and the Cuban René Francisco, a new addition to the gallery’s portfolio. 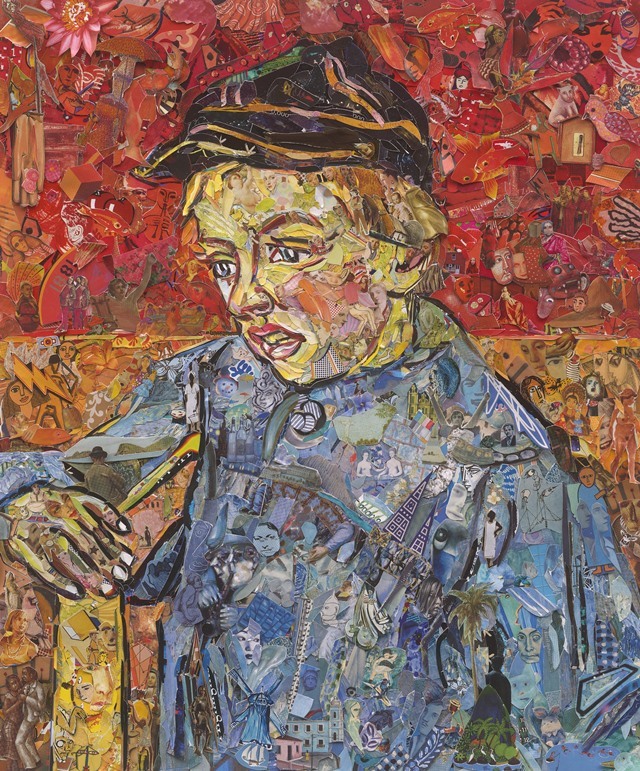 Vik Muniz’s 2016 collage in homage to MASP’s 1888 Van Gogh oil, “The Postman’s Son,” at Galeria Nara Roesler at SP-Arte 12th edition. 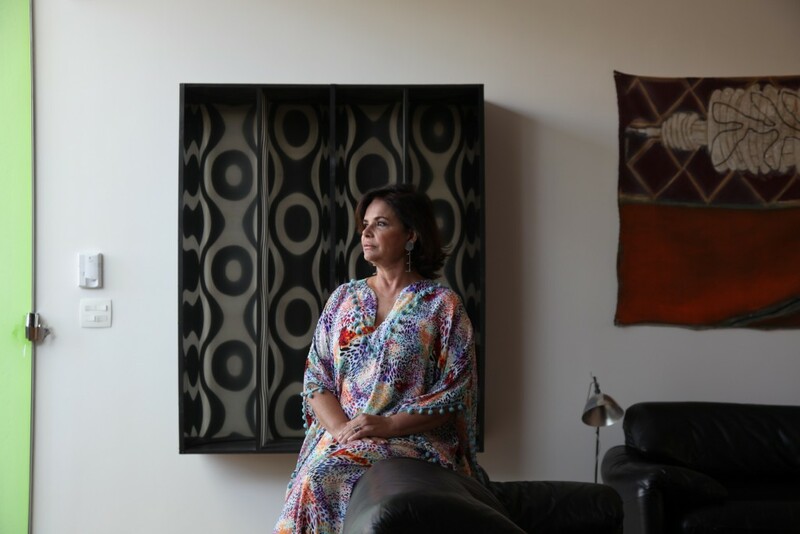 Your São Paulo gallery boasts twenty-six years of experience in the Brazilian art market after fifteen years managing an art gallery you founded in Recife, in Brazil’s Northeast. That amounts to four decades dedicated to art. What do you have to say about Brazilian collectors? Brazilian collectors are beginning to mature. There is a group of highly committed, very low-profile collectors who basically buy Brazilian art and have amassed wonderful collections. Many of them started out with paintings of traditional Brazilian masters but in the last decade have expanded into contemporary art and are very serious in their pursuit. This happened most significantly with the arrival of SP-Arte in 2005. Having Brazilian and foreign galleries all in one venue each year stimulated the move toward art collecting. Initially, one starts buying art for the sake of decorating the living room. The next step is creating relations among the works themselves. The third step is an urge to have new works that will give added value to the collection as a whole. In this stage the collector usually begins to free himself from the restrictions of the vertical wall, moving into the realm of three-dimensional pieces. This is when the act of collecting gets serious, becomes a regular part of his activities with responsibilities such as preservation and listing of works and following the art market keenly. Brazilian collectors are known to have a very regional focus: they collect Brazilian artists exclusively. Does this happen because traditionally the dollar is always strong in comparison to our currency? Or is this mentality changing? Traditionally speaking, Brazilian collectors have focused only on Brazilian artists for several reasons, including that only a few years ago Brazil was closed within its borders. It was so amazingly difficult to bring in works from abroad; the red tape was insurmountable. It’s somewhat smoother now but still takes an enormous effort. But the mentality is changing. The longtime collector is motivated by competitiveness—he enjoys broadening the scope of his collection, he is proud to own an important collection, he finds pleasure in the game. However, some have confided in me that they feel disadvantaged when buying abroad due to the relationship they have with an international gallery that is not the same that they maintain with a Brazilian gallery, which has known them for some time, acknowledges their collection and understands what they’re searching for. They feel they may be buying lesser works after the foreign gallery offers its top works first to its regular collectors. So is this why you opened your New York gallery this year, to fill out the gap? Brazil year after year is always a big surprise. Actually, we’ve been meaning to open a gallery in New York for ten years. We’re present annually in eight international fairs—for five years we’ve participated in the Hong Kong art fair—we have relationship with art institutions worldwide and now we have collectors in the US, Europe and China. Being based in Brazil comes along with all the limitations of doing business here so we always dreamt of having our gallery abroad stimulated by the connections we’ve been building. We’re participating upfront in the expansion of the international art market aiming to make Brazilian artists well known abroad. I won’t sit and wait here with arms crossed and lose ground, to only make the move abroad when the market is over-flooded. New York is New York—maybe in a few years our American operation will be larger than ours in Brazil. What would you say is Brazilian art’s contribution to the global scene? We need a greater distance to fully analyze this in depth. I’ll answer you in a few year’s time… However, I do feel that the international art establishment intellectuals—those who generate the artistic discourse that Western art follows—haven’t grasped how complex in its grandeur is this continent-sized country with its cauldron of ethnicities and geopolitics. 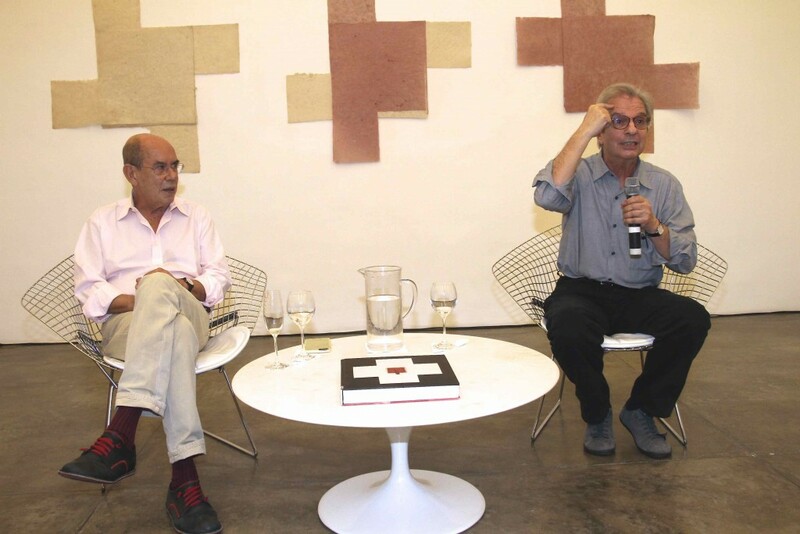 They still see us as having made our only contribution to art history in the 1950s/1960s with the Concrete movement from São Paulo and Rio’s Neoconcretists, which was basically the same school of geometric abstractionism broken down in two. The movement influenced major international artists like the Swiss Thomas Hirschhorn, who speaks openly about it. Sure, it’s a principal contribution to the evolution of art in the twentieth century and is already officially documented as such, but certainly it is not the only legacy Brazilian art has made and will make to the art world.